Smooth through clean, towel-dried hair with your fingertips, and comb through. 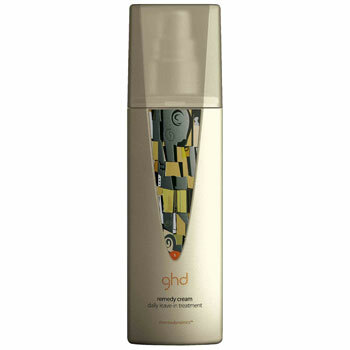 De-stress the hair with this leave-in strengthening treatment, ideal for dry hair. It lubricates, glosses and protects each individual hair, and prevents breakage. Contains UVA protection. Aqua, Sodium Polycrylate, Hydrogenated Polycene, Panthenol, Parfum, Polyquarternium-55, Proplene Glycol, PPG-3 Benzylethemyrisate, Butylene Glycol, Benzophenone-4, Polyquarternium-39, Propylene Glycol, Hydolyzed Vegetable Protein PG-Propyl Silanetriol, Diazolidinyl Urea, Helianthus (Sunflower) Seed Extract, Saliva Officinalis, Arnica Montana, Chamomilla Recutia, Calendula Officinalis, Achillea Millefolium, Betula Alba, Tetradibutyl Pentaerithirityl Hydrohydrocinnamate, Ethyleparaben, Methylparaben, Propylparaben, Butylparaben, Isobutylparaben, Phenoxyethanol, Potassium Sorbate, Geraniol, Butylphenyl Methylpropional, Linalool, Hydroxyisohexyl 3-Cyclohexene Carboxaldehyde, Alpha-Iso Methyl Ionone, EDTA, Citric Acid, Sodium Hydroxide.